After 6 days of trekking on foot through the various towns and quintas of the Douro wine valley, we ended up back where we started in Pinhão. For our last two nights in the Alto Douro, we were staying at another quinta, Quinta de la Rosa, located just west of Pinhão right on the banks of the river. And when I say we were staying at the quinta, in this case it’s pretty literal, Quinta de la Rosa is actually quite an active Quinta (indeed, getting to the guest rooms means literally walking right by the vats where they are stomping the grapes), and they’ve also got a nice variety of vineyards and hiking trails to explore as well. 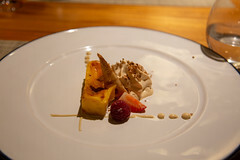 And, with their latest renovation, they added a modern tasting room and a restaurant, Cozinha da Clara. For our first visit, we did the a la carte menu. For a la carte meals, Cozinha da Clara offers both a “Traditional” and a “Contemporary” menu, each with a variety of fish, meat, and poultry dishes focusing on fresh and local ingredients, paired with the house wines from Quinta de la Rosa. After a simple amuse bouche, the meal started with a bowl of onion soup. While you might mentally have the image of a French onion soup, this was definitely a Portuguese soup, served up with Moira de Lamego, a really dark pork and wine sausage. It starts as a bed of onions and the sausage, and then they serve up the soup base over it. 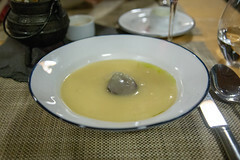 I really enjoyed it, being reminiscent of a “more onions” version of my favorite Caldo Verde. Next up, some sardines. 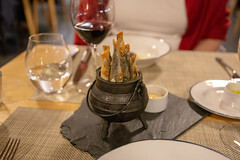 I’m generally not the greatest fan of seafood for both flavor and dietary restriction reasons, but these were perfectly executed sardines: fresh and flavorful, lightly breaded and fried to a perfect light crisp, served up with a tart tomato aioli, these were some of the best sardines I’ve ever had. Speaking of seafood, I’m not often one for “menu regret”, but when eying the most excellent looking octopus served up at pretty much every other table, I think if we go back I’ll have to give it a try. 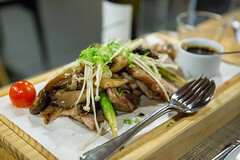 For my main course, I opted for Iberian black pork, served as a pile of medallions tossed with a selection of mushrooms, onions, asparagus, and a few other vegetables. The pork was immaculately tender, cooked perfectly, and just oozing with some of the most wonderful pork flavor. This was nicely complement by the rich Port jus served alongside, the al-dente vegetables, and a very rich truffled mashed potatoes. This was, by far, the best non-ham pork item I’ve ever had, and the most enjoyable main course I’ve had so far in 2018. For Carol’s main course, she opted for the bacalhau à bras. 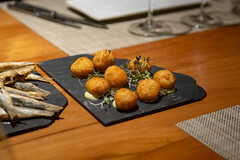 Interestingly, bacalhau à bras, a classic Portoguese dish of salted dried cod served over a bed of matchstick potatoes, was on the Cozinha’s “contemporary” menu instead of the traditional one, because of the unusual presentation approach. But this was delicious. The bacalhau was tender and flavorful, with a nice crisp to the top, and the matchstick potato side worked perfectly. Overall, it was a very pleasant dinner, and when we found that there were openings for the “Claire’s dining table” experience the next night, we decided to book that as well and return the next evening. I rather enjoyed the special “Claire’s dining table” seating; sitting with another, slightly younger couple from Philadelphia, it was nice to compare our Douro experiences and talk about the food, which was essentially an expanded prix fixe version of our previous night’s meal. 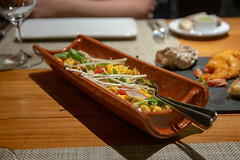 After a very pleasant starter of eggs and arugula (I didn’t get the Portuguese name for this, but it was a very pleasant dish), we got a wide variety of appetizers. This included another round of the sardines and some excellent bolinhos de bacalhaus, and some surprisingly tangy chicken wings. Then, instead of the previous night’s Iberian pork, the chef’s table special was 40 day aged beef. And opting for the Reserve wine tasting, we got a particularly nice pairing of wine with each course. 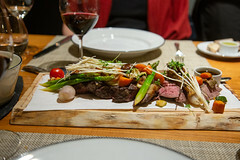 The 40 day aged beef, served in almost exactly the same style as the Iberian pork, was also quite a good treat, with some perfectly cooked, thinly sliced steak medallions layered with onions, mushrooms, and asparagus. This was still an impressive dish, and quite flavorful, although in the end I’ll have to give the edge to the previous night’s pork. Closing things out for the tasting was a deconstructed pastel de nata, the Portuguese classic that’s usually a small tart (available from pretty much any bakery in Portugal), and while I’m inherently skeptical of most “deconstructed” dishes, this worked well: a nice bit of pastry, some sweet custard, and some fruit. 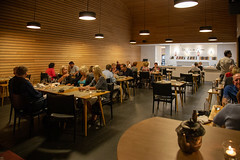 Really, coming on the heels of Quinta do Portal‘s four nights in a row of fine dining, Quinta de la Rosa’s Cozinha da Clara showed that fine dining that respects Portuguese traditions and ingredients is doing quite well indeed in the Douro wine valley. I’d love to come back here, especially if I could get more of the pork.